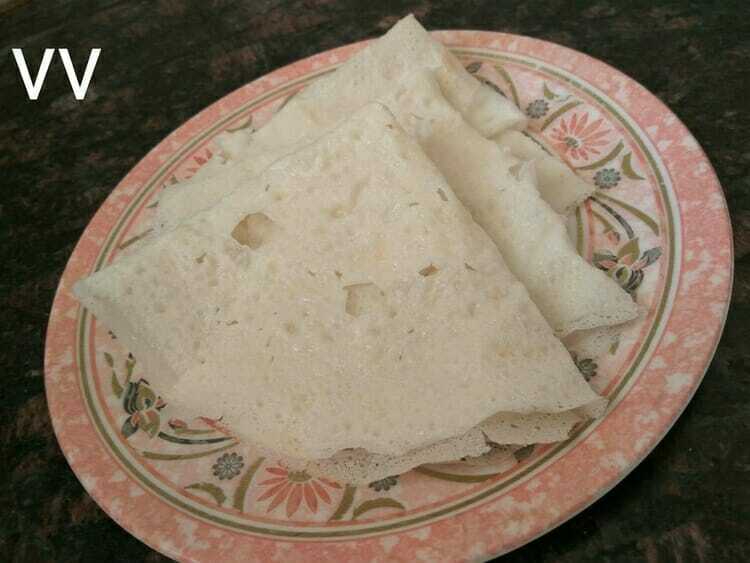 Neer dosa is a delicacy of Karnataka, generally prepared with rice. Came across this millet version from Swayampaka.com and made a few changes to suit my needs. Wash and soak the millet in 1.5 cups of water for 2 hours. Grind the millet smoothly with just a few table spoons of water along with grated coconut, coconut oil and curd. Adding curd and oil gives softness to the dosa. Add the strained water and make a thin dosa batter. Using a nonstick pan make dosas just by pouring. Do not spread the batter with the ladle. I tried this yesterday.the dosa was co crisp.. I followed the same measurement you have given.What could be the reason? The only reason I see for the dosas becoming crispy is over cooking. Otherwise, it will be petal soft.